This program is for children ages 2 1/2 – 4 years old. 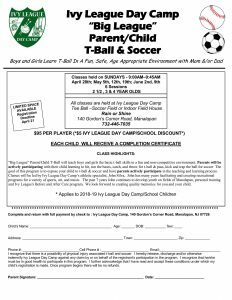 All classes are held at Ivy League Day Camp Tee Ball and Soccer Outdoor Fields or Indoor Field House. Spring Fling – Saturday, May 18th! Bring your family and friends to see all of the BIG LEAGUE FUN we have at Ivy League all summer long! Spend a day playing sports, checking out go-carts and mini golf, climbing the rock wall, and jumping on the Euro Bungee! Take a tour with our leadership team and meet our awesome Ivy League staff! Most Important, HAVE BIG LEAGUE FUN!! Come join us on Saturday, April 27th from 11 AM – 2 PM for our “Spring into Camp” Open House! Take a tour of our facility, meet our warm, wonderful leadership team, and enjoy a day full of activities! Please keep a look out to find out what else is new and exciting happening this summer! NEW Flex Schedule Program for Summer 2019!! Ivy League is now offering a Flex Schedule Program! 732-446-7035 if you are interested in enrolling for this summer! Hiring NOW for Summer 2019! Join the Family! Click Here to See Open Positions! Summer 2018 Yearbook Video Released! Click here to view our Summer 2018 Yearbook Video! Book Your Next Event in Our 7,000 sq ft. Field House! Check out the Brochure for pricing and additional services! Download our Referral Form for 2019! Call for a Personal Tour with Owners for Summer 2019! Spring Break Mini Camp Program! “Lucky to Have Fun at Ivy League Day Camp” OPEN HOUSE! Please join us on Sunday, March 17th from 11 am to 2 pm for our “Lucky to Have Fun at Ivy League Day Camp” OPEN HOUSE! We have surprises in store for you, cool crafts to celebrate St. Patrick’s Day, and tours with our wonderful Owners/Directors! If you come to one of our open houses, you will receive $100 off tuition for the summer of 2019!